thredUP is the largest online consignment shop where you can find like-new women's and kid's apparel (clothing, shoes, and handbags), choosing current styles from over 25,000 brands. I recently made my first purchase. I spent less than $75 thanks to the discount thredUP offers new shoppers. The purchase included a mix of discount brands (like F21 and Old Navy) and slightly more upscale and unique pieces including a Hive & Honey dress made from recycled paper! Then a day later I made another one! I spent about $120 but my haul was mostly designer stuff like J Brand jeans, 7 for All Mankind skinny jeans, and vegan Neuaura boots. It's super easy to find clothes that you love and actually fit. No more having to dig through endless racks of clothes to find something you like, only to discover it's not your size. Their simple, user-friendly platform makes shopping a breeze! On thredUP you even can create a personal shop that contains your favorite brands, your size, and type of apparel. For example, if you're planning to go to a wedding and need to find the perfect dress, you can create a shop with these restrictions: Dresses. Formal. J.Crew. Size 4. Once you've created and saved a personal shop, you'll see what's new in the shop each time you log onto thredUP. After you've found the dress for the wedding, you can always delete the shop or just tweak it so now you'll search brands you love in your size for the coziest fall sweater. Check out the site now to try this cool feature and get $20 to spend on the awesome stuff you find! Almost everything is in awesome, like-new condition. Lots of items on thredUP still have tags on them! There are some items that have minor flaws, but they are completely transparent-- going so far as to highlight and describe exactly what the issue is. The items are packed with love and care. 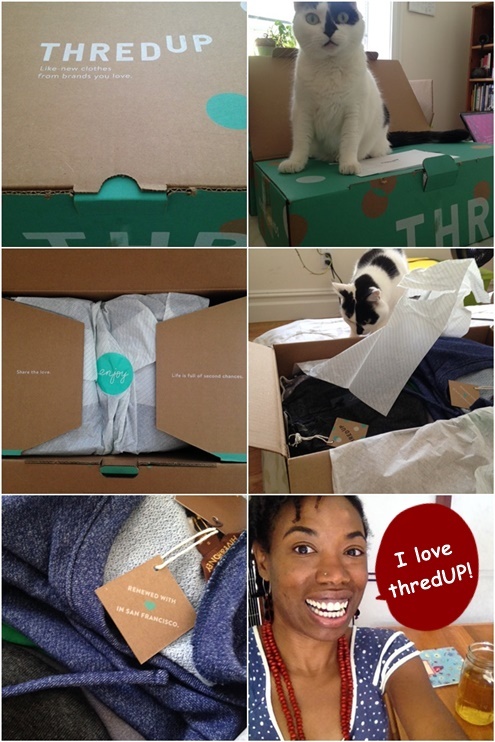 thredUp makes every effort to make your purchase feel special and luxurious. Clothes arrive folded beautifully, wrinkle and lint-free. The boots I ordered didn't even have a speck of dust on the soles! Also the bundle of items is wrapped in tissue paper and sealed with a cute sticker. I didn't like the fit of a pair of jeans and a sweater that I purchased, which often happens when you order online. The return process was as simple as putting the unwanted items back in the box, spending three minutes on the website to create a return slip and shipping label, and dropping the box off at the post office. Done! thredUP shares my passion for human rights and the environment. So many of us First Worlders want lots of new clothes for super cheap. Sadly, our planet can't sustain this. The garment industry abuses of workers and the environment is heart breaking. I love that thredUP gives style conscious consumers the opportunity to look great and re-use resources. You can earn extra money and clean out your closet by selling them the clothes you and your kids never wear. thredUP supports charity. They'll donate 5% of your order to the school of your choice this month. thredUP creates green, non-exploitative jobs in the fashion industry for Americans. Yay! Another reason: Friends- YOU!- get $20 to spend on thredUP by using my referral link>>> Click here to check out thredUP now and see if you find something you like. Disclosure: thredUp did not sponsor this post or my purchase. The opinions expressed are based on my experience. I get $20 store credit (at no cost to you) when you make your first order via my referral link so thank you for using it if you're interested in browsing thredUP. Olivia Lane Lovejoy is a Blogger, Green Living Educator, and Health Coach trained at The Institute for Integrative Nutrition.